A few months ago my friend and I had a our first play with the beta version of IBM’s Chef Watson. However, at that stage….. it was mostly a case of “Go home Watson… You’re drunk”, after the recipes told us to “de-bone” the tofu, or take something and cook it in 2/3 “Theutes”…..
Yep. We had no idea what Theutes was either, and neither did the internet. The general idea behind Chef Watson is that it will take recipes available through Bon Appetit and use the knowledge it has of food to make substitutions so that a new recipe and flavour combination is made. Last week the Chef Watson app was launched and made available to the public, so we figured it was time to try and make something…. and the Chef Watson challenge was on! The synergy icon below the ingredients represents how well your ingredients go together….. We switched the original fourth ingredient (chickpeas) for cheddar cheese in order to get so slightly less crazy ideas, the looking through the selection, we plumped for a recipe Watson called “California Avocado Fried”, based on this recipe from Bon Appetit. The original Watson recipe you can find here, but here is our recipe below, with all the modifications we made to Watson’s instructions in italics. Place eggs, panko (breadcrumbs), and flour in 3 separate shallow medium bowls. Season white corn and avocados with garlic powder. Working in batches, dredge in flour, shaking off excess. Coat with egg, allowing excess to drip back into bowl. Coat with panko (breadcrumbs), pressing to adhere.Note: steps 3-5 were followed for the avocado slices, but for the corn… we figured that individually coating kernels of corn with flour, egg, and breadcrumbs was going to be a little tricky, so instead, the remainder of the egg leftover after coating the avocado slices was combined with the corn, some flour, and breadcrumbs, to form small balls (kind of tater tot sized) for frying. Pour oil into a large deep skillet to a depth of 1 1/2 inches and heat. Working in batches, fry white corn (balls) and avocado slices, turning occasionally. Transfer to a paper towel lined plate to drain, and season lightly with salt. Spread chickpea on wonton wrappers and top with fried white corn and avocados, purslane, green curry paste, and cheddar.Note: here is where another couple of deviations occurred. – Instead of tortillas, we had wonton wrappers. Although perfectly edible uncooked (perhaps), we spritzed a little oil in a pan and fried them for a minute of so, turning halfway, in order to make them nice a crispy. – In the original recipe, instead of chickpeas, there are refried beans…. whole chickpeas =/= refried beans, so we heated a little oil in a pan, and cooked the yellow curry paste to release the flavour, then drained and rinsed the can of chickpeas, and whizzed it up in my little chopper, and added this the the pan and cooked it with the curry paste to add a little flavour. 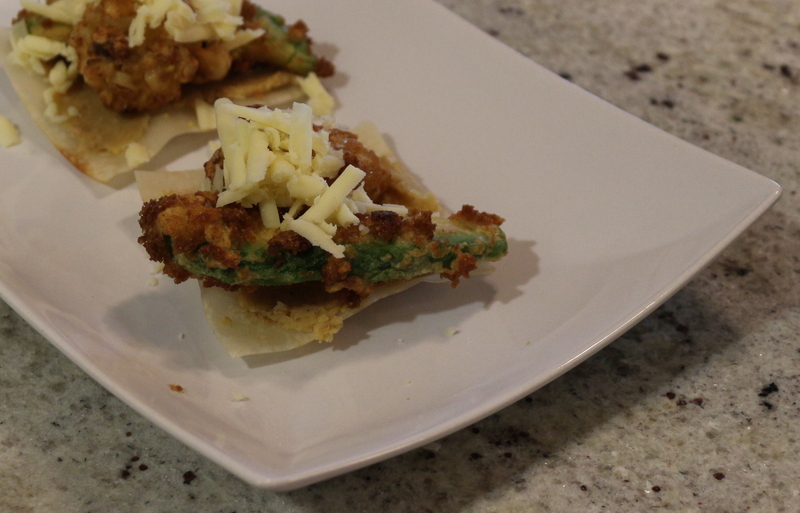 It was then put back into the little chopper with a little water, and combined into a spreadable paste.This paste was spread on the crispy wonton wrappers, which were then topped with a corn ball, fried slice of avocado, and some grated cheese. Serve with dressing alongside. – we had no dressing! So there you have it! 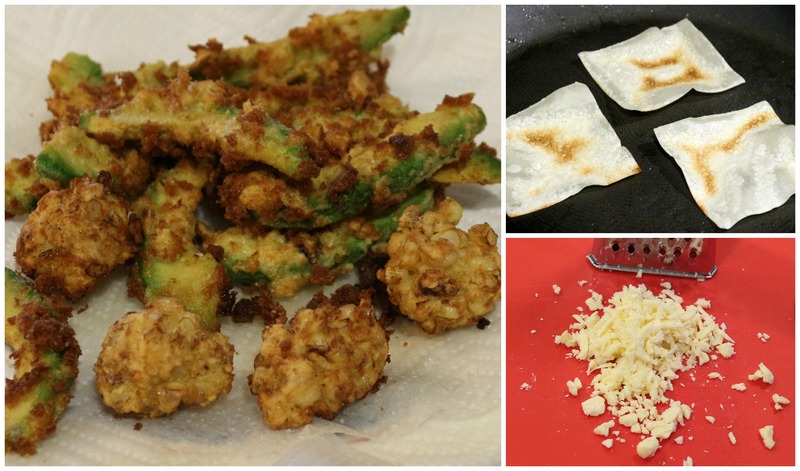 I give you….. California Avocado Fried! ← A gentle reminder for forgetful people.